It’s obviously a necessity, and at its best it can make a trip, but it’s also the subject that can put people off, make them change their destination or even stay at home in extreme cases. The food of the destination you choose to visit can be the most exquisite memory you return with, or indeed it can be the dinner table/pub complaint about hideously awful it was. So what to make of Laos food? Well firstly if you’re planning on spending any time here you do need to like Asian food. You aren’t going to find a McDonald’s or KFC anywhere – it simply isn’t going to happen, in contrast to somewhere like Thailand. In the resorts of the bigger towns and cities you will find western food – of a sort – so a steak is by no means out of the question in those places. But when touring and finding lunch, it’s going to be Lao, or at a push Thai or Vietnamese influenced. For many travellers this is in itself part of the charm of it. You can find a place such as Seno (supposedly named by the French from Sud, Est, Nord, Ouest since it sits at a crosroads) and find the entire main street is given over to grilled chicken, the local speciality. 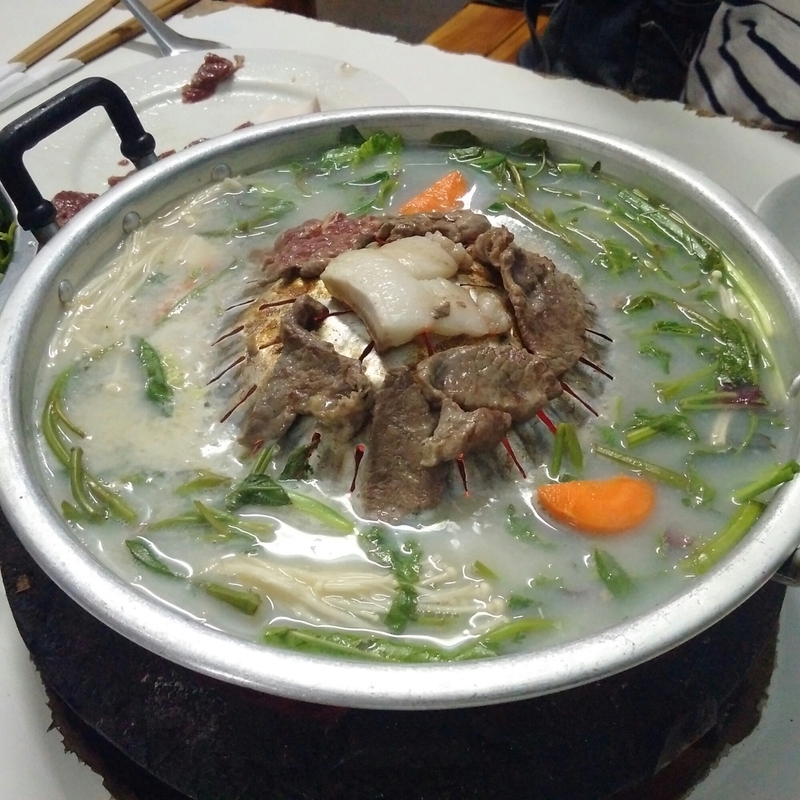 Perhaps you can be tempted by the Lao version of a barbecue, which if anything is most reminiscent of a Swiss raclette where the meat is served raw and you cook it yourself on a central heated section that warms the soup surrounding it. That was a lot of fun actually. For those terrified of hot food, there is little to fear. Lao cuisine is more reminiscent of Vietnamese food than Thai, based around soups comprised of whatever ingredients are to hand, or fried rice dishes that again will be dished up with greens that can either be eaten separately or mixed in the main meal. If you do wish for something with a little more kick, the chili is abundant but served on the side to provide a little extra spice….er. Ok quite a lot of extra spice. This not like adding supermarket chili flakes, so be gentle with your mixing in the main meal. This is fiery stuff, a little is sufficient and add to it as needed, don’t overdo it and find you can’t eat it. This not an idle warning, it’s dynamite. But you’ll soon learn the right amount to add, if you do like heat you’ll be in heaven. If you don’t, skip it and enjoy the flavours. That’s not to say there aren’t things to try for the more adventurous. Some local specialities fully satisfy any wish to do something different. How much more different can it get? For the record those are assorted insects. And also for the record that isn’t my hand – as a lefty I can guarantee that – now I quite like trying things. But there are limits. 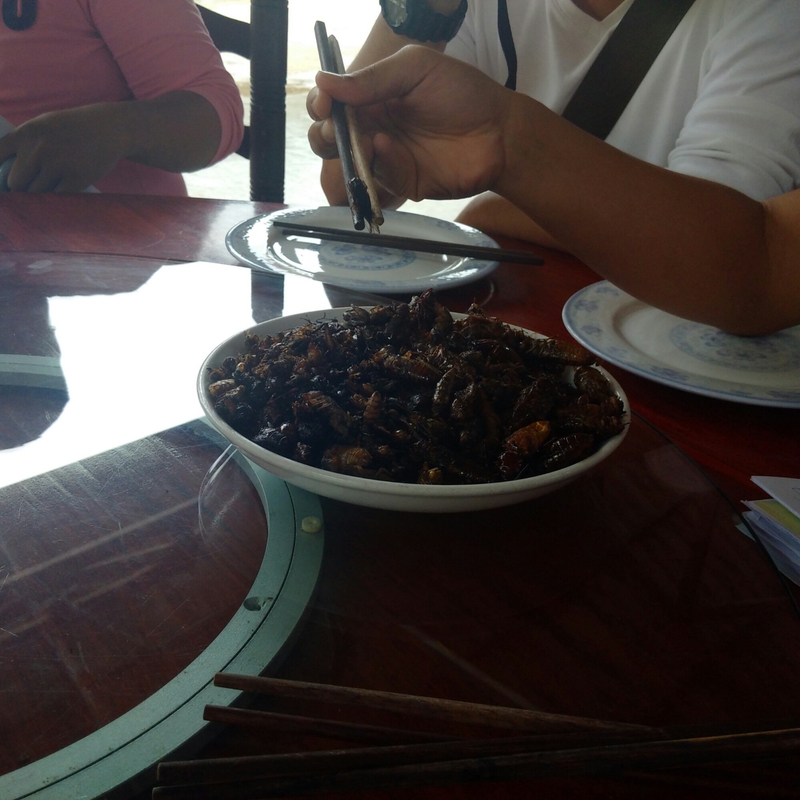 And eating roasted insects is it. To my considerable amusement the look of appalled horror on the faces of my colleagues as one hotelier insisted I try the duck (very good – more on that property later) passed without any sense of irony given their propensity to ingest creatures normally the preserve of the cat before you can stop him. Yep, it’s western values I’m afraid, deal with it. I don’t want to give the impression this is the norm. You really aren’t going to be randomly presented with these things. But like many places the phrase “local delicacy” roughly translates as “you are out of your minds. No. Just no”. The food is really good. A decent company will ensure you visit local places and you’ll get to try the local variations on the central theme. It’s delicious, and it should cater for most tastes. Lao restaurants are not exactly commonplace in Europe or the US, so it will be a new experience. And one to savour in all respects.